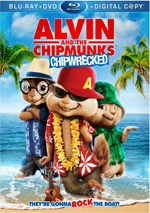 After terrific profits for both 2007’s Alvin and the Chipmunks and 2009’s Alvin and the Chipmunks: The Squeakquel, the series sagged with 2011’s Alvin and the Chipmunks: Chipwrecked. While it didn’t bomb, Chipwrecked’s $97 million US looked weak compared to the $200 million-plus each of the first two made. After a four-year gap, the franchise returns with 2015’s The Road Chip - and the financial decline continues, too. Road Chip snagged about $85 million US, though it still came up with $232 million worldwide. Given that I suspect these movies don’t cost much to make, I expect a fifth flick will arrive eventually. 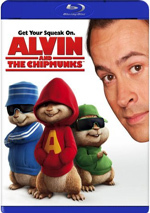 I’ve watched all four Alvin movies, though I can’t explain why. They’re all pretty mediocre, and Road Chip does nothing to break that trend. Dave Seville (Jason Lee) starts to date doctor/single mother Samantha (Kimberly Williams-Paisley), and things seem to be serious. Dave takes Samantha to Miami for a business trip, and it looks like he may propose to her there. 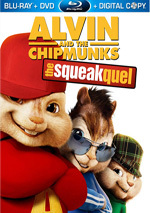 This worries his chipmunk wards Alvin (voiced by Justin Long), Simon (Matthew Gray Gubler), and Theodore (Jesse McCartney). They fear that Dave will start a human family and dump them. Even if Dave keeps them, they fret about life with Samantha’s seemingly sadistic son Miles (Josh Green) - and Miles doesn’t want a stepdad, either. In the midst of all this anxiety, the chipmunks and Miles join forces to stop the proposal. They work their way from LA to Miami to interfere with Dave’s plan – and encounter many bumps along the way. After four films, I suspect we know what to expect from the Chipmunks movies, and the answer is “not much”. That’s especially true in terms of story. The first one came with a fairly logical natural arc, but the three sequels have seemed more like character bits cobbled together without much real narrative. With its “road trip” rationale, that seems true for Road Chip. I’d guess that the story pitch was “Chipmunks on the road – shenanigans ensue” and the script didn’t say a whole lot more than that, as the tale lacks much to hold it together. It essentially delivers a bunch of little gags and not much else. If the bits worked better, that wouldn’t be a bad thing, but they tend toward the lame side of the street. Actually, I must admit that occasional chuckles occur, as a few decent jokes pop up along the way. Alas, these remain fairly few and far between. The film remains heavy on cheap gags and lacks much inspiration. The tail wags the dog, as jokes dictate character/narrative instead of the other way around. Could you do worse for family entertainment than Road Chip? Sure – it’s largely uninspired, but it’s not painful. Still, with so many more satisfying flicks out there, why bother with such mediocrity? Footnote: observant readers will notice that the review above largely duplicates my comments for Chipwrecked. Is this lazy? Probably, but if Fox is going to continue to make the same movie over and over, why shouldn’t I just run the same review? 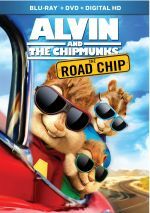 Alvin and the Chipmunks: The Road Chip appears in an aspect ratio of approximately 1.85:1 on this Blu-ray Disc. Across the board, the movie looked good. Sharpness remained positive. The occasional wide shot appeared a tad soft, but not to a substantial degree, so the image usually seemed tight and well-defined. I witnessed no jaggies or moiré effects, and edge haloes were absent. Print flaws also caused no distractions. Colors showed some life. Even with instances of the usual teal, the movie went with a variety of hues – especially ambers and purples – that appeared well-represented. Blacks came across as deep and tight, while low-light shots were smooth and clear. This became a satisfying image. Nothing out of the ordinary arrived with the film’s DTS-HD MA 7.1 soundtrack. Occasional scenes opened up the mix, especially those in clubs or on the road. Still, not a lot of dimensionality emerged here. The soundscape presented a reasonable sense of place and not much more. I felt audio quality seemed positive. Speech was concise and distinctive, while music appeared peppy and full. Effects lacked much to stand out, but they appeared accurate. The track connected to the story in an adequate manner. A moderate collection of extras arrives here. The Story So Far lasts four minutes, 57 seconds and recaps the first three movies. It includes no commentary or interviews; instead, it simply shows clips that synopsize the prior films. If you need a refresher, go for it! With the five-minute, 46-second Cue the Chipmunks, we hear from dance choreographers Tone and Rich Talauega, director Walt Becker, Fox 2000 president Elizabeth Gabler, and actors Jason Lee, Bella Thorne, Josh Green, and Tony Hale. “Cue” looks at the execution of the movie’s climactic performance scene. Outside of some decent behind the scenes glimpses, it offers a puffy, superficial clip. Next comes Our Furry Planet. It goes for four minutes, 35 seconds and gives us basic notes about both actual and cartoon chipmunks. A featurette with more real data would’ve been interesting, but “Furry” is too cutesy to succeed. Alvinisms fills two minutes, 50 seconds. Like “Story So Far”, it simply provides a montage of movie clips, all of which focus on Alvin. It seems forgettable. After this, we find an Animators’ Reference Reel. In this one-minute, 47-second piece, we see movie footage on the left side of the screen and live-action animator material on the right. It’s a short but fun look at the animators’ methods. With Ultimate Playlist, we find three areas. “Music Machine” lets you see 11 musical performances – including some from the other three movies. That makes it more valuable than it might have been. Three “Music Videos” appear: “Shake Your Groove Thing”, “Vacation” and “Bad Romance”. These can be viewed with or without lyrics. The videos tend to focus on movie clips and seem mediocre. Finally, “Lyric Videos” come for five songs: “Juicy Wiggle”, “Uptown Munk”. “Wreck the Halls”, “Pizza Toots” and “I Want Chipmunks for Christmas”. These mostly use movie shots, though some unique elements occasionally appear. The lyrics take up a lot of screen space, which makes them unusual, I guess – but not interesting. Munk Rock runs one minute, 48 seconds and features Lee, Thorne, Becker and musician Redfoo. This becomes nothing more than a quick promo piece. Next comes an Dance Instructional for “Squeaky Wiggle”. The one-minute, 44-second piece brings in Redfoo to teach us the dance. I’m not saying Redfoo is the most annoying person on the planet – but I’m not saying he isn’t, either. Even 104 seconds of Redfoo is too much. With After the Party, we get a one-minute, 29-second “munkumentary”. Here Redfoo talks about what intense partiers the chipmunks are. No thanks. Two state-related featurettes finish matters: Bound for Georgia (2:16) and Road Chippin’ Through Georgia (5:03). In the first, we hear from Gabler, Lee, Becker, Hale, 2nd unit camera operator Edward A. Gutentag, actor Kimberly Williams-Paisley, and executive producer/unit location manager John Starke. “Chippin’” features Lee, Starke, Becker, Gutentag, Williams-Paisley, Hale, Green, and the Talauega brothers. Both show how amazing it is to film in Georgia. Neither seems valuable, but if you watch “Chippin’”, you can skip “Bound”, as it’s essentially just a shorter version. The disc opens with ads for The Peanuts Movie, Kung Fu Panda 3, and Ice Age: Collision Course. Sneak Peek adds promos for Strawberry Shortcake: Berry Tales and The Sound of Music 50th Anniversary. We also see two trailers for Road Chip. A second disc offers a DVD copy of Road Chip. It includes “Story So Far”, “Ultimate Playlist”, trailers and the “Georgia” clips. Four films in, fans know exactly what to expect from the Alvin and the Chipmunks franchise: mediocre family entertainment. The Road Chip replicates the formula with a watchable but forgettable experience. The Blu-ray brings us pretty good picture and audio with a minor set of fluffy supplements. For better or for worse, Road Chip offers typical Chipmunks fare.